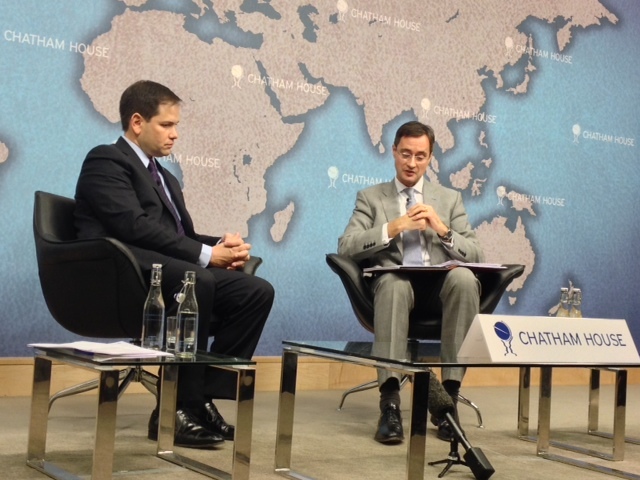 Senator Marco Rubio spoke at Chatham House on December 3, firmly establishing the think tank as the destination of choice for visiting American politicians eager to establish an international reputation ahead of the 2016 presidential election. Following hot on the heels of former Secretary of State, former senator, former First Lady of the United States (and Arkansas for that matter) Hillary (sometimes Rodham) Clinton, the visit of Senator Rubio marks London as the new epicentre of an emerging International Primary, designed to raise their profiles ahead of Ohio and New Hampshire. In a 30-minute address, Senator Rubio provided a wide-ranging vision of the future direction that US foreign policy should take, addressing the Special Relationship and Washington’s dealings with a variety of nations, leaders and locations. 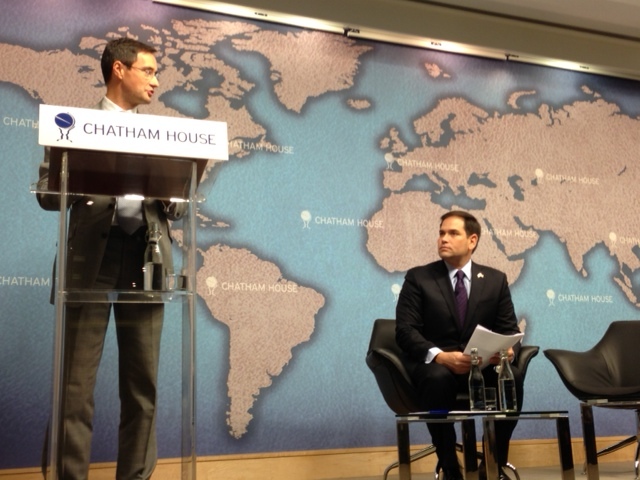 In a solid, workman like address, Rubio discussed Iran, Russia, China, the UK and the development of EU-US trade ties. The defence and advocacy of Liberty was at the heart of the talk and was returned to time and again as Rubio threaded a narrative of US commitments and responsibilities through a series of locals, events, and personalities. Rubio was steadfast in his positions in regard to Iran and Russia. As a member of the influential Senate Foreign Relations Committee, he forecast that bi-partisan legislation would be presented as early as next week that would increase pressure on Iran, at the same time that the Obama administration is seeking a rapprochement with Tehran. Rubio remains convinced that Iran is merely using the discussions as a delaying tactic to enable it to achieve an enrichment capacity and that a nuclear empowered Iran would begin a regional arms race. Putin’s Russia also came in for heavy, repeated criticism, as the senator took issue with the manner in which it was seeking to use energy supplies to exert influence over Central and Eastern Europe, and the manner in which Ukraine was being weakened as a result. In response to a series of questions, coordinated with the usual grace by Chatham House Director Robin Niblett, Senator Rubio was adamant that while he believes in the concept of Medicare and Medicaid, the mandated spending programs as presently constructed are financially unsustainable. Addressing these issues, however, will require more than charm and youthful vigour, for they remain the third rail in American domestic politics. Rubio advocated the reductions in trade tariffs that would accompany the potential TTIP framework, while acknowledging that the US would struggle to accept much of the EU regulatory frameworks on international trade and commerce. Rubio declared that the United States needs a strong European Union but that it must respect the UK’s decision with regard to its continued membership. Returning to foreign policy, Rubio was quick to dismiss talk of ‘hawks and doves’ as being an outdated division in the 21st century. He advocated the use of diplomacy, foreign aid and soft power in US foreign activities and stressed that for Americans, foreign policy was domestic policy. While stressing that he did not believe that the president was required to seek Congressional approval for a course of action, Rubio presented a concise explanation for his lack of support for Obama over Syria. As he had mentioned previously Rubio had sought US involvement for 2 years, during which he had advocated allying with moderate opposition forces that now appear to have dissipated; he opposed the limited engagement that the president had called for; and he found the plans lacking in direction. Worryingly, however, he made reference to ‘the forces of darkness and evil’, language that is all too reminiscent of a recent president whose lack of nuance was portrayed as mere naivety. This is one area where progress needs to be made in the coming months. This was then was a sold delivery, though not without the occasional misstep; a speech that was read, rather than delivered. It was a shopping list of ideas and aspirations, designed in part to tell an audience what they wanted to hear; a speech that quoted both Reagan and Thatcher and even made reference to One Direction. Rubio was adamant that in a season of doubt, the United States remained vigilant and ready to lead. He noted the 6 decades of declinist talk and of the various world powers that had been predicted to assume the mantle of global leadership, all of whom had failed to rise to the occasion. 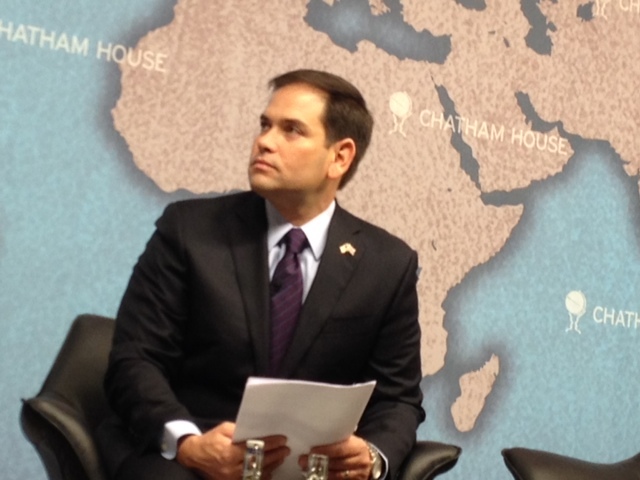 With the revolution in US energy production and forecasts of its future as an energy exporter, Rubio was certain that the future was indeed a bright one. As the son of Cuban immigrants, Rubio has a fascinating narrative and is well positioned to take full advantage of his heritage, youth, and position as senator for the key state of Florida heading into 2016. Accordingly, this visit was all about establishing international credibility and elevating the senator in the eyes of potential kingmakers in the GOP. Senior parliamentarians with whom he met were understood to have been impressed, although those who had not met with him were heard to mutter in the corridors of power ‘Isn’t he a bit of a nutter?’ Well, the simple answer is, no, he isn’t, and it is concerning that such a view was being aired so openly. Whilst the depth of the senator’s grasp of the issues was never tested, his breadth of knowledge and the span of the talk were more than sufficient. Cuba was mentioned just once, clearly signalling that Rubio is seeking to position himself not as the Cuban candidate, but simply as a candidate who happens to be of Cuban extraction. He will, doubtless, reap an electoral windfall from the huge influx of Latino voters who are expected to form a huge voting bloc in 2016. One wonders in what capacity London will next welcome Marco Rubio to these shores?